Nook Tablet better than Amazon Fire? At $249, Barnes & Noble’s Nook Tablet is $50 more than Amazon’s upcoming Kindle Fire, and it doesn’t support access to the Android Market. But, let’s look at what the Nook Tablet does offer. First off, you might want to know the Nook Tablet supports streaming video from services such as Netflix and Vudu (which are pre-loaded by the way). Movies and TV shows should look great on the tablet’s 7″ 1024×600/169(PPI) touchscreen display with 16 million+ colors. And, the tablet’s dual core processor and 1GB RAM should be able to handle higher quality streaming HD video. Other features of the Nook Tablet include access to over 2.5 million books, built-in WiFi, email and web access, Nook game apps such as Angry Birds and Scrabble, and many other apps for education, productivity, news, social, kids and lifestyle interests. So what does the Nook Tablet have over Amazon’s Kindle Fire? 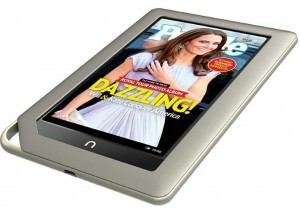 The Nook comes with 16GB of RAM expandable via SD card (Fire only has 8GB). You can also walk into any Barnes & Noble location if you’re having a problem with your Nook. Other claims such as the Nook having a better display (they both have 1024×600 resolution, 16+ million colors and IPS), weighing less (the Nook Tablet weighs 14.1 ounces while the Fire weighs 14.6 ounces), and having a longer battery life (how can you really measure battery life especially while streaming video), seem to be unsubstantiated. The Nook Tablet will start shipping next week and hits stores on Thursday, Nov. 17. As well as Barnes & Noble locations, other retailers such as Target and Best Buy will carry the product.